Brother-Hawk provides unique insight into performance issues by monitoring your databases 24x7 and alerting you to performance issues before they become performance nightmares. DBI has automated advanced lights-out database monitoring to free our customers to pursue other important business opportunities. 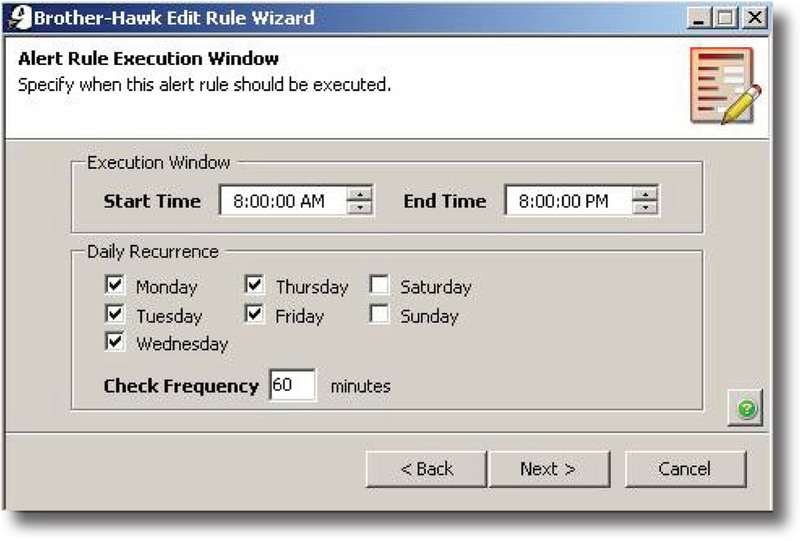 Brother-Hawk extends DB2 LUW database performance monitoring functions to include three levels of customized alerts --- your lights-out alerting of potential performance management issues has never been so on-time and on-target. 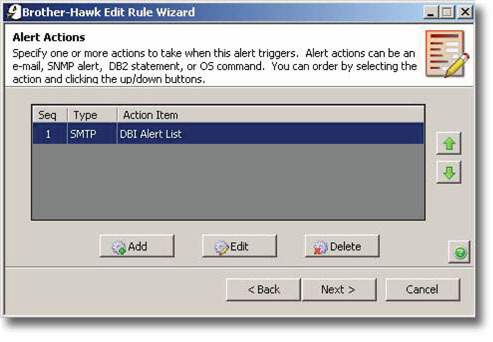 You're in control --- define alert rule filters to monitor all databases, specific tables in a specific database, tablespaces, SQL statements, and even Transaction Response times. Choose to monitor and alert 24/7 or select any window of time; choose days and hours to best meet your needs. You also control the frequency of your rule execution. Monitor and alert once a day or every 30 minutes --- you're in charge. 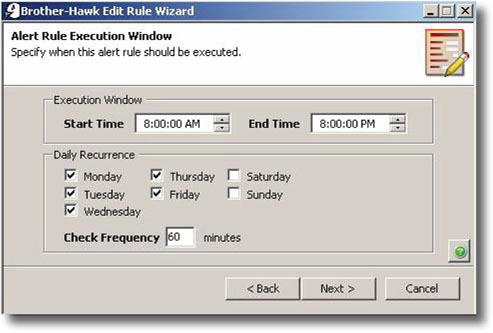 A unique alert squelch feature suppresses duplicate alerts to minimize alert noise. Squelch analyzes event correlation and de-duplicates alerts to provide clean, meaningful alerts. 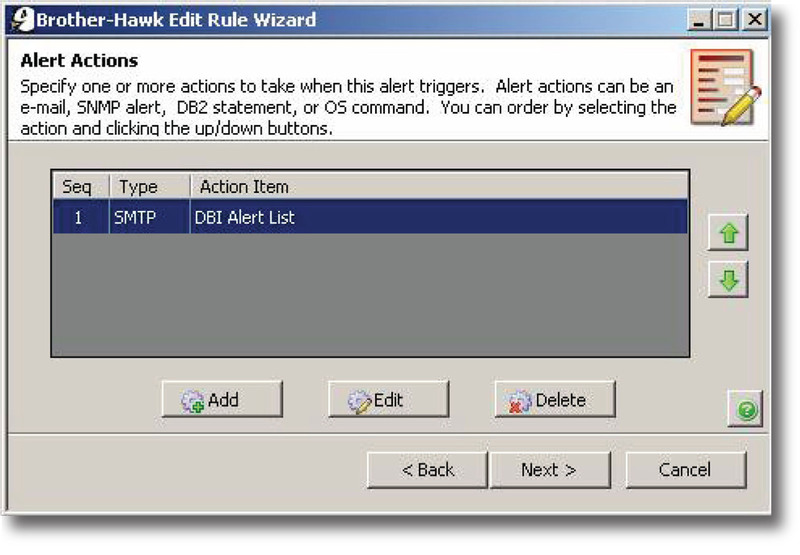 Execute operating system commands when an alert triggers. You define the actions to take in response to specific alerts. For example, to force an application off, execute runstats, or allocate additional space. Choose to receive e-mail and/or SNMP trap messages when alerts occur, and plug Brother-Hawk into your enterprise IBM Tivoli, CA Unicenter NSM®, HP OpenView, or similar consoles if you like. Tailor your alert message to the delivery method. Your message can be as terse or verbose as you choose. Everything is managed through an easy-to-use central console. If you can code an SQL statement to test for the presence of a condition, you can easily create an alert with Brother-Hawk. Alerts are not limited to just performance data--- you can optionally alert on business data, too. With DBI, now you can Fearlessly embrace change! Your Business runs 24x7 but your DBA team probably requires a few hours of rest each night. What's more, even during regular business hours busy database professionals often have several responsibilities competing for their time and attention. Watching an interactive monitor for every database - all day long - just isn't possible. The demands of 24x7 business require that problems are rapidly identified and isolated on a continuous basis, and proper team members must be swiftly summoned to the rescue to avert situations that are potentially injurious to business operations. Meaningful alerts must capture the attention of team members. Duplicate alerts found in most of today's alerting systems create excessive noise and distractions. This results in "The Boy Who Cried Wolf" syndrome when meaningful alerts get lost in duplicate alert noise. Brother-Hawk™ for DB2 LUW is a separately licensable add-on feature to DBI's Brother-Panther®. Brother-Hawk sends automated, customized, and meaningful alerts based on characteristics of real-time and recently collected data. Brother-Hawk is a separately licensed add-on feature to Brother-Panther® for DB2 LUW.